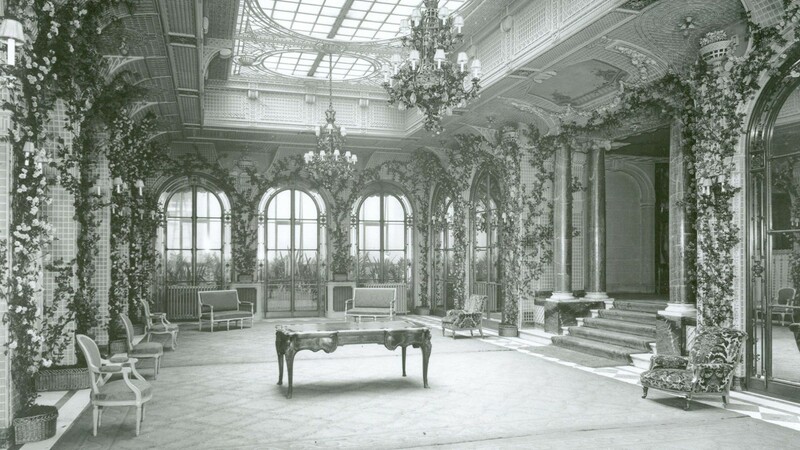 Built by the theatrical impresario and builder of the Savoy Theatre, Richard D’Oyly Carte, The Savoy hotel had more than a hint of the theatrical about it when it opened in 1889. With no overall architect, the hotel plans were signed by an experienced hotel builder, George Holloway. The exterior was designed to look like a fashionable waterside Continental hotel; long rows of balconies ran all the way up the façade along the River Front. Designed by premier Art Nouveau designer A.H. Mackmurdo, the balconies offered alfresco dining with an enviable view of the River Thames. 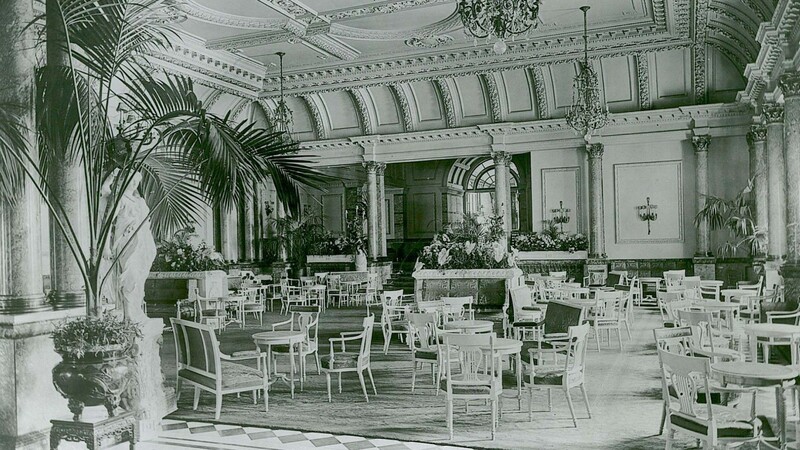 Collinson & Locke, the interior designers responsible for the Savoy Theatre, now turned their hands to hotel interiors featuring lavish decorative moulding and gilding in the public areas, and plenty of floral wallpapers in the guest rooms. 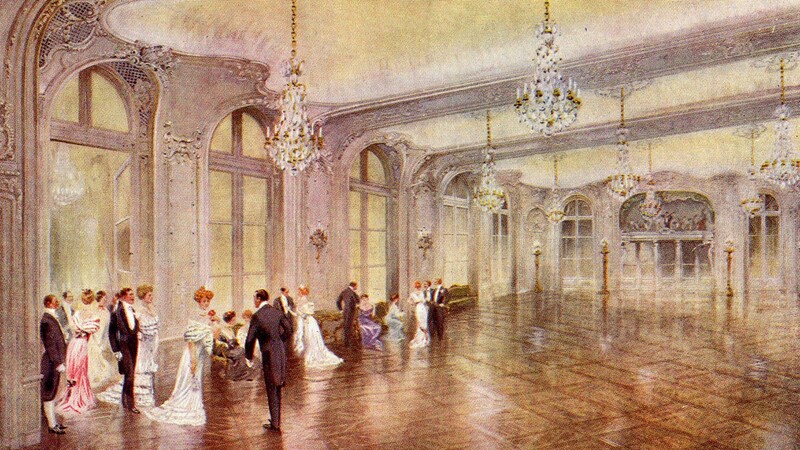 The décor was classically Victorian, but notably luxurious and comfortable. The beginning of the 20th century saw Richard D’Oyly Carte’s death in 1901, and his son, Rupert, as the new Chairman of the Board. The company had spent the last decade acquiring a block of land next to the Savoy Theatre, and north of the original hotel. The whole site was levelled in 1903, and architect Thomas Collcutt designed the Strand blocks, turning the hotel to face forward squarely towards the Strand. For the new century came fresh new décor, unifying the now-conjoined old and new blocks of the hotel. In came light, bright Edwardian design thanks to a fashionable revival of 18th century Robert Adam-style interiors, replacing Victorian design throughout The Savoy. Of the 1904 décor by Collcutt & Hamp, the Front Hall is a striking example. One other notable survival from this period is the Lancaster Ballroom, which was designed by French architect René Sergent, in 1910, and retains Sergent’s original interior. Fast-forward to the 1920s. With the end of the Great War it was time to look to the future. At least one of the company directors went to Paris in 1925 for the International Exhibition of Modern Decorative and Industrial Arts, and returned filled with enthusiasm for “arte moderne” now known as Art Deco. The first art deco interior at The Savoy was British designer Basil Ionides’ redecoration of the private dining room “Pinafore” in 1926. Ionides’ design is retained to the present day. The following year a young architect, Howard Robertson, wrote to The Savoy pitching for work. His first job was to remodel the gentlemen’s toilets, but in late 1929 Robertson unveiled his most famous and prominent design, The Savoy’s iconic stainless steel “Savoy” sign which runs the width of Savoy Court. Robertson, later Sir Howard Robertson, continued to design art deco interiors for The Savoy for several decades, although by the 1960s the interior design department, headed by Richard D’Oyly Carte’s grand-daughter, Bridget (later Dame Bridget) D’Oyly Carte, looked to more modern designers like Michael Inchbald for new ideas for The Savoy. A rise in interest in the heritage of older buildings that began in the late 20th century, led to a change of tack for the hotel. Sympathetic redecoration and restoration using reference photographs from the hotel archives were now the order of the day. These new interiors, although clearly modern, sat more comfortably in their historic surroundings. 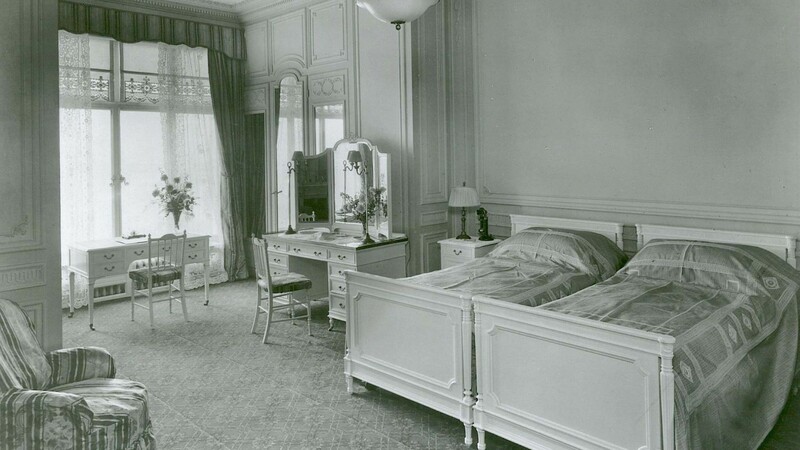 The two predominant design styles throughout the hotel were clearly still traditional Edwardian, and art deco; and for this reason, French designer Pierre-Yves Rochon used these twin lynch-pins to inform the restoration project, which closed The Savoy in 2007 for a top-to-toe renovation. The hotel reopened in 2010, beautifully restored and ready to face the 21st century in style.